Tumors of the kidney are being identified at smaller sizes and earlier stages than years previous due to the wide spread use of CT and MRI scanning (see Figure 1). As a result, this has provided urologists with the opportunity to achieve higher success rates in curing patients with kidney tumors. Despite earlier diagnosis, however, CT and MRI scans are unable to differentiate between benign (i.e. not cancerous) versus cancerous tumors. Furthermore, up to 30% of these small kidney tumors that are surgically removed are later found to be benign. Although a needle biopsy is an option for preoperative diagnosis of such small kidney tumors, it carries the risk of bleeding, infection, transfusion and more importantly the risk of tumor spread. This highlights the importance in exploring efforts at improving the diagnostic accuracy of kidney tumors with preoperative imaging tools. Figure 1. 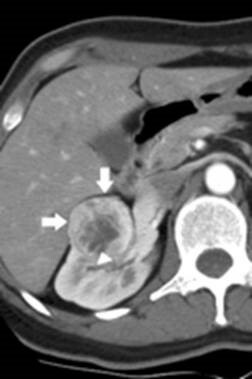 CT scan demonstrating a solid 3.5cm kidney tumor (arrows) arising within the right kidney. The nature of this mass (i.e. benign vs. cancerous) cannot be differentiated based on CT scan findings. One set of imaging technologies that may hold promise is that of optical imaging such as Fiberoptic Confocal Endomicroscopy (Figure 2). This imaging tool has shown promise at differentiating biological tissues on the cellular level. Dr. Su is actively collaborating with the Department of Pathology in investigating this technology and studying the appearance of benign and cancerous kidney tissues. The eventual hope is to develop an “optical biopsy” imaging tool to preoperatively determine the nature of a patient’s kidney tumor and to help select which patients are at greatest need for surgery and which can be simply observed and monitored. Figure 2. 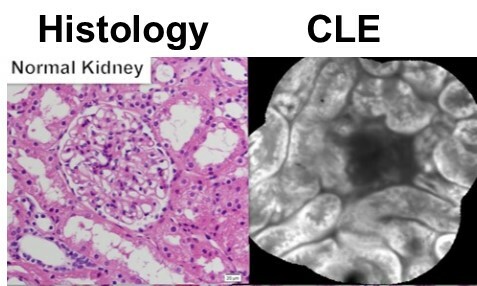 Comparison of confocal laser endomicroscopy (CLE) image and standard histology. Note the similarity in the cellular structure and organization.